Donnelly’s Uniforms is the official supplier of St. Francis Xavier School’s uniforms. Students should always be clean and neatly dressed. Parents and students are asked to follow the UNIFORM CODE and refer to the HANDBOOK for more specific guidelines. Our SWAP SHOP is available at the school year-round for uniform exchanges. 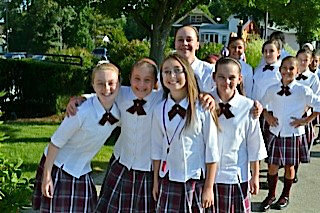 To order new uniforms, call Donnelly’s Uniform Apparel 800-498-0045 or visit the website link at www.donnellysclothing.net. Questions regarding the dress code can be clarified with the classroom teacher or principal. The dress code is in effect from the first day of school until the last day of school unless otherwise directed by the principal. The most current catalog with pricing is available online.